JKA Shotokan Ireland is directly affiliated to the Japan Karate Association Headquarters in Tokyo Japan. JKA Shotokan Ireland is also a member of Kawasoe Senseis JKA Afro Eurasia group within the JKA. 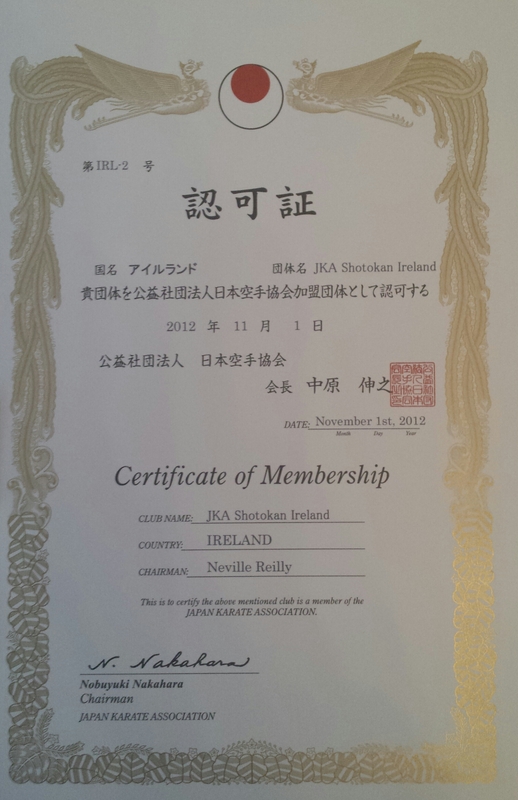 JKA Shotokan Ireland now has a direct affiliation to JKA HQ in Tokyo as Kawasoe Sensei’s group in Ireland. Our Technical Director is Sensei Masao Kawasoe, 7th Dan JKA who, together with our senior Irish instructors has overseen the technical development of our association since its foundation. JKA Shotokan Ireland is the operating name of the Irish Shotokan Institute which was founded as an unincorporated not for profit association in 1993. In March 2015 the Irish Shotokan Institute changed it's operating name to JKA Shotokan Ireland to more accurately reflect its international affiliation and karate development.